Thanks to everyone who participated in our 48th annual production sale. See you next year. Welcome! We focus on raising horses with superior conformation, gentle dispositions and World Champion bloodlines. 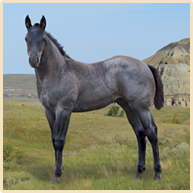 For 25 years our program has featured the Blue Roan genetic contribution of our great AQHA stallion, McKeag. He enabled us to be breeders of Blue Roans before Blue Roans were cool. Our AQHA Grullo Stallion, Goldun Poco Storm, is a Reserve World Champion sired by, Jaz Poco Goldun Blue, a World Champion Grullo Stallion. 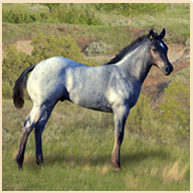 With great confirmation, bloodlines, gentle dispositions and stunning Blue Roan & Grullo color our horses are the perfect package for any rider or horse enthusiast. Our AQHA Legacy program proudly offers Grullo and Blue Roan Quarter Horses for sale during our annual production sale traditionally held the 3rd Saturday of September. 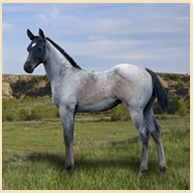 Our colorful Blue Roan and Grullo Quarter Horses are not just stunning to look at but also combine a unique set of traits that are desirable to horse owners. Although our focus is on Blue Roan and Grullo Quarter Horses, we have Quarter Horses for sale in a multitude of colors and ages. As well as our foals, we have for sale Quarter Horses that have been in training and used on our ranch. We breed Quarter Horses that we love to ride and choose bloodlines from the greats in order to raise ideal Quarter Horses. Whether it is pulling calves to the branding iron, roping across the arena, or taking an evening pleasure ride, our colorful Quarter Horses are continually proving their versatility.